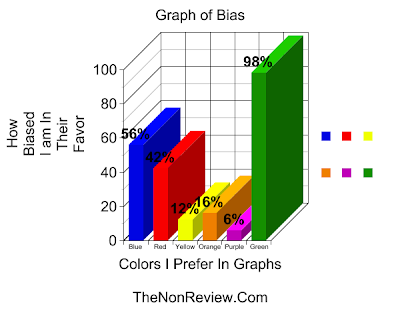 Biased towards green because it's the color of money? I am loving the green because it is the color of my eyes. Red reminds me to stop, something I never want to do. Yellow is too cautious for me. I am not cautious at all. The Irish in me is 37% offended! A searing, hard-hitting look at this complex problem. I shall be writing a 70 page report about this and forwarding it on to you. Green is easy on the eyes. I like that one one best too. Oh the irony, ridiculousness and lunacy of this graph - I'll be laughing for a long time to come. THANK YOU, TS. Mon Dieu...don't tell me you are still holding on to your Green hornet mask after all these years! If only I had known this before Christmas I wouldn't have got you that neon pink graph. Can you ever forgive me?